Printing barcodes with the Dymo LabelManager 500 Touchscreen label printer is a breeze. You might be printing barcodes for shelves or cupboards, for asset tracking or for inventory bins. No matter what the purpose is, designing and printing your barcodes will happen fast. The LabelManager 500TS prints 6 different barcode types : UPC-A, UPC-E, Code 128 B, Code 39, EAN 13 and EAN 8. And, you can choose whether or not to print the barcode text, and if you do, you can choose to print the barcode text either above or below the barcode.Optionally, you can add text before, after, above, or below the barcode. - Select Auto-fields and Barcodes on the Insert tab. - Tap Barcode. The Insert Barcode dialog box appears. - Select a barcode type from the Barcode type list. - Enter the data for the barcode in the Barcode data box. To insert a symbol, tap Add symbol and select the desired symbol. - Below barcode -to place the barcode text below the barcode. - Above barcode - to place the barcode text above the barcode. - Not displayed - to not print the barcode text. - Select a size for your barcode from the Barcode size list. For best results, select Medium. - Select the desired barcode position relative to other text on the label. - Tap OK. The barcode is inserted on the label. Note: The barcode is treated as a single character on the label. You can delete the barcode just as you would any other character. 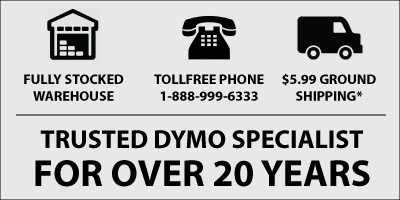 The Dymo LabelManager 500TS ships from both our East Coast and West Coast warehouses, so delivery is quick. Additionally, we keep the full range of Dymo D1 labels in both warehouses.